The following provides an overview of the E, A and B level testing for Wilderness Area testing. Please refer to the current version of the International Testing Standards for Rescue Dog Tests of the International Canine Federation and the International Rescue Dog Organization for more information. Commands: repeated and familiar voice commands and hand signals are permitted. Handler can chose their own means of searching the area. The handler releases the dog at an appropriate area. Once the dog has commenced the search, the judge will give the handler permission to move from the start position. When the dog finds, he must alert with no help from the handler. The handler must confirm to the judge that his dog has alerted. The handler will be given a sketch of the area or a map. The search area will be clearly marked and boundaries defined. 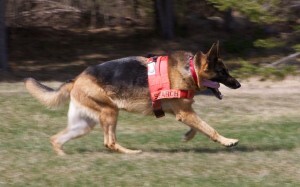 The handler must inform the judge of the search tactics to be used by the handler prior to the start of the search. Once the first victim is found, the handler can send his dog to search for the next victim from the location the handler was when he reported the alert.